Please use the links below to review answers based on your area of study at Cornell University. Cornell offers need-based financial aid to undergraduate students who are U.S. citizens, permanent residents, undocumented students with DACA status, long-term undocumented students without DACA status, and long-term green card applicants that have not achieved legal Permanent Resident status. Additionally, we offer a very limited amount of need-based aid for international students and undocumented students without DACA status. Students who qualify are offered a specific aid package designed to fully meet their need with a combination of grants, loans, and employment opportunities. Learn more about our financial aid initiatives here. Information about applying for undergraduate financial aid can be found here. Your financial aid To Do List can be accessed here. "Initiated" means that we are missing the item. Items will disappear from your To Do List when they are complete. Here are four videos that highlight different aspects of the financial aid application process. 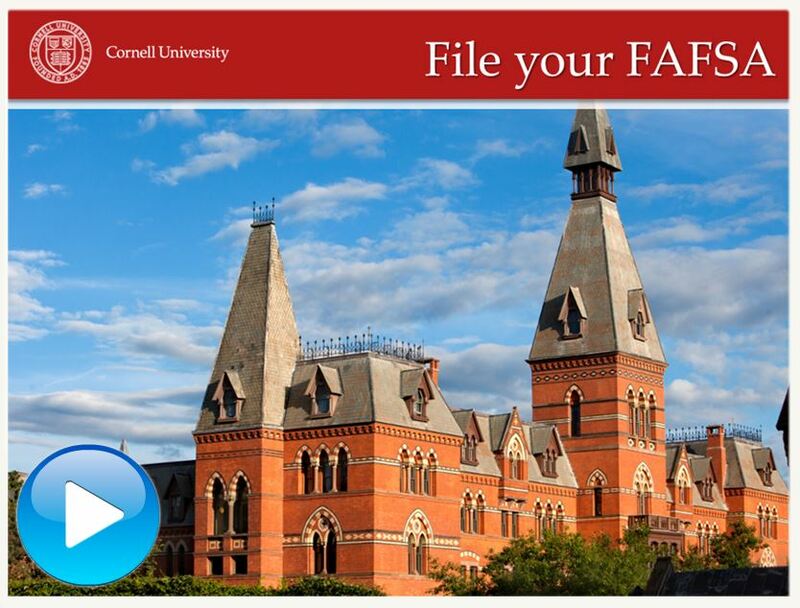 Financial Aid Application Process describes Cornell's financial aid program. The CSS Profile discusses the College Board's online aid application called the CSS Profile. File your FAFSA discusses the Free Application for Federal Student Aid, the online application for federal financial aid. IDOC reviews the College Board's document imaging service that Cornell utilizes to collect and process supplemental materials required as part of the financial aid application process. Consideration for graduate student fellowships or assistantships is processed with the student's admission application. Students need to select the box on their admissions application indicating that they want to be considered for available fellowships or assistantships. Students are notified in their acceptance letter the amount of aid, if any. There is not a separate financial aid application process outside of the admission application. Graduate students who are U.S. citizens or permanent residents can apply for federal graduate student loans at any time throughout the academic year. More information can be found here. Other suggested questions: What types of financial aid are available? How do I check the status of my financial aid application? Does Cornell offer any scholarships? How do I apply to the College of Human Ecology? How do I apply? Can you pursue pre-business at the College of Human Ecology? Can I study business at ILR? Does Cornell offer a tutoring service? What clubs and organizations does Cornell have? What loans are available? How do I file my FAFSA? Does Cornell grant deferrals?